Garth Ennis – Where Monsters Dwell! This May, legendary comic scribe Garth Ennis returns to Marvel Comics proper, and he’s bringing his frequent collaborator Russ Braun along for the Secret Wars ride! Today, Marvel is pleased to announce WHERE MONSTERS DWELL #1 – a brand new 5-issue limited series launching during Secret Wars! Dogfights! Dinosaurs! Dames! Danger! This book has it all! Enter the Valley of Flame, Battleworld’s home to the deadliest creatures prehistory has to offer. Stranded amidst its Pterodactyl-filled skies? Karl Kaufman, the high-flying aerial ace known as the Phantom Eagle! Marooned in the Valley of Flame alongside socialite Clementine Franklin-Cox, he’ll face down dinosaurs, cannibals, and the worst that Battleworld has to offer from inside the cockpit of his biplane. 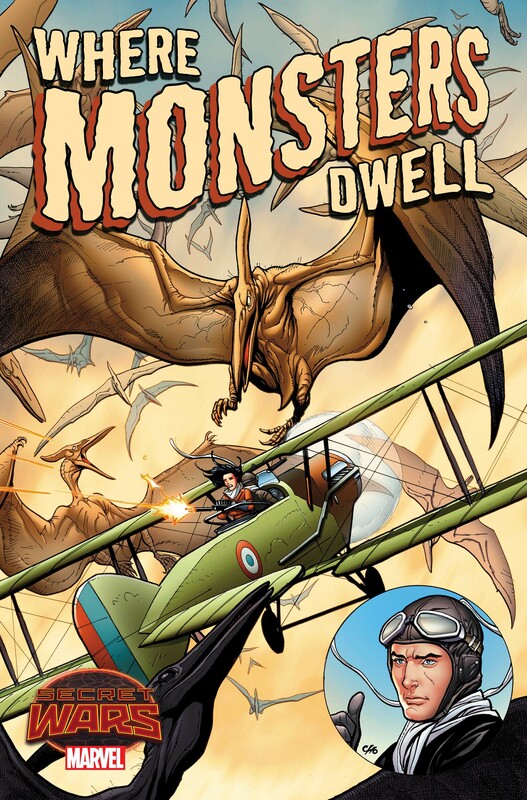 Fighter planes and prehistoric creatures collide this May in a raucous tale of the Phantom Eagle as Garth Ennis and Russ Braun dare you to enterWHERE MONSTERS DWELL!